Parasitic infections are a common problem in pets and are quite annoying when they linger on for long. Pet owners who are experienced already know how hard it is to deal with these issues if they are recurring. Though there are many topical and oral options available on the market, it is better to select the one that suits your pet the most. If he doesn’t like topical treatment and is very fidgety then chewable are the best bet to opt for. They come in palatable flavors and aren’t messy as well so, no more chasing your pet for the application of the product and no more avoiding your kids from touching their furry pal. Nexgard and Nexgard Spectra are two such drugs that have conquered the market for being highly effective at removing the parasites. Owners often get confused when it comes to choosing one of them against the other. Well, if you are also the one stuck with the same dilemma, here is the vivid difference between the functionality of these two chewable tablets. Nexgard is a beef flavored chewable manufactured by the renowned company Merial. The product is formulated to kill fleas and ticks in dogs with its swift action. Afoxolaner – an active ingredient in Nexgard acts on the nervous system of the parasite and causes hyperexcitation. This eventually leads to the death of the critter. Nexgard also effectively kills Black Legged Deer Tick, American Dog Tick, and Lone Star Tick. Thus, other than interfering with the flea activity, it also kills these 3 species of ticks the same way. Nexgard Spectra is the advanced version of Nexgard. Though its administration and protection time is exactly the same as Nexgard, it provides a wider range of treatment. Where Nexgard is only effective against fleas and ticks, Nexgard Spectra successfully eliminates fleas, ticks, and intestinal worms as well. Additionally, it prevents heartworm infection when provided regularly. This broad spectrum of treatment is accredited to the presence of two active ingredients instead of one i.e. Afoxolaner and Milbemycin Oxime. Afoxolaner kills ectoparasites whereas Milbemycin oxime kills endoparasites. Both of these products are invariably effective on parasites. The only difference lies in the types of parasites they act on. Nexgard only works on ectoparasites whereas its counterpart readily eliminates ectoparasites and endoparasites both. 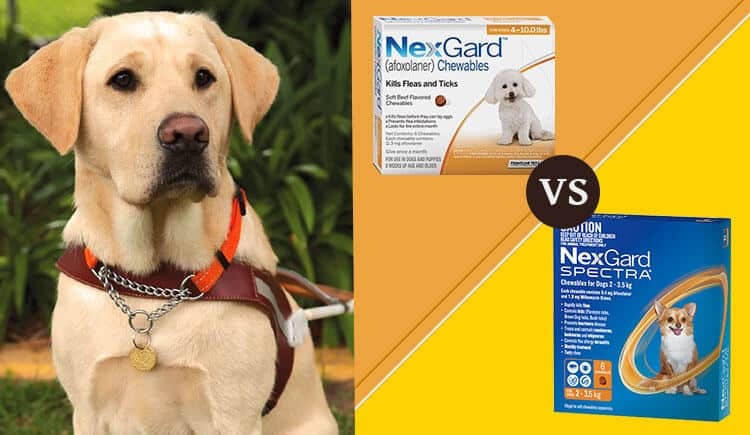 So, if your pet is only dealing with fleas and ticks, you just need to administer Nexgard to your dog. On the other hand, if he also has intestinal infection besides fleas or ticks, a pet owner must administer Nexgard Spectra to treat the pet.